Virtually every aviation accident involves catastrophic consequences. These include private, chartered or commercial airlines. Normally, nobody survives. These accidents require extensive investigation and a multitude of expert witnesses because of the exposure to the companies involved. Approximately 50% of aviation accidents, it has been suggested, are caused by pilot error and approximately 13 % by mechanical error. We have recently seen many accidents involving commercial airlines and even vanishing commercial planes. With the development of technology, the black boxes found in the planes can help provide some answers for the error that caused the accident. Recently, there has been news regarding people on the ground targeting commercial jets with lasers while they are in flight. The use of these lasers can interrupt the flight and cause or help contribute to a serious accident. Helicopter accidents are unique claims to pursue. Helicopter accidents, although just as catastrophic as airplane accidents, usually involve experts that are especially familiar with the maintenance and operation of helicopters. There are many variables involved in helicopter accidents that need to be examined by a qualified expert before rendering any expert opinions. Often, an expert in reconstructing the reason for an airplane accident will be different from the expert reconstructing the cause of a helicopter accident. At Foran & Foran, P.A. we do have more than 60 years of combined experience in representing clients regarding helicopter accidents and/or have the ability to co-counsel with other attorneys familiar with this type of litigation. Much initial investigation of airplane or aviation accidents in the United States is conducted by the U.S. National Transportation Safety Board (NTSB). Obviously, the airline industry has their own stable of experts whose job it is to find some reason other than operator error or mechanical problems as the cause for the accident. In the United Kingdom, the Air Accident Investigation Brach (AAB) conducts most of the airplane accident investigations. In Canada, the Transportation Safety Board (BST/TSB) conducts investigations of these accidents. 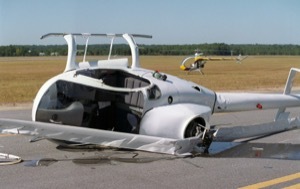 Whether the cause of the accident or injuries are a result of pilot error, mechanical breakdown, landing gear problems, evacuation slide problems, computerized auto-recovery and alert system failure, engine failure or any other type of problem, you will need an experienced airplane accident attorney who can assist you in these cases and who has the resources to cooperate with other national attorneys to consolidate efforts and proceed as a team to make a claim against the airline responsible for the accident. The legal information on this site is not intended to be legal advice. Contact one of our experienced helicopter accident attorneys or lawyers today to get specific information and answers for your specific situation.